Up to version Veeam ONE 7 the account used for connecting Veeam ONE to a vCenter only required „Read-only“ permissions as a minimum. 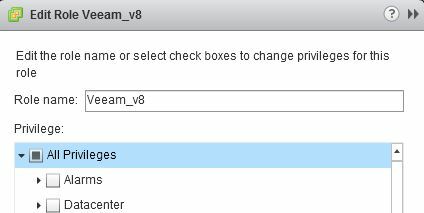 This has changed with Veeam ONE v8. For example, the software now uses the new CIM-SMASH protocol to collect hardware sensors data. The account used for connection to vCenter must have at least the permissions as described in the How-to below. Save the settings and apply the new role to the vCenter User – done!